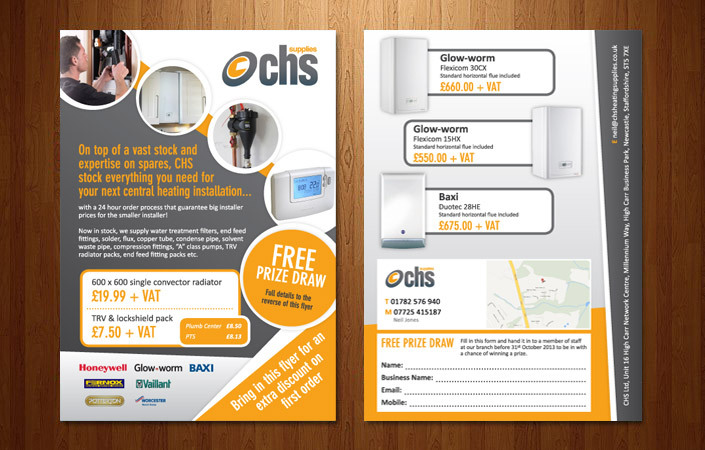 CHS Heating Supplies in Newcastle was looking for a company that could design, print and deliver a tasteful looking flyer to hand out locally. The flyer needed to push their location, services and products. A selling point to the company was their prices, so a small price comparison to other businesses was agreed along with adding a prize draw planned to encourage customers to visit the store. The flyer follows the company’s branding, making the vibrant orange quite powerful and attractive complementing the greys and white.